The Jubilant crew are starting to fix their sailing schedule. 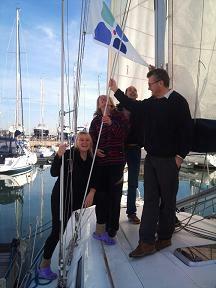 New sails have to be tested, the crew need to be tested and a boat polar needs to be worked out. The first sail of the year is booked for 27th January to try a new spinnaker, the crew are hoping for winds of around 15 – 25 knots for the trial. The uk crew will be onboard for this trial. Two qualifying races have been entered so far with the plan to enter further races. Cervantes Trophy race & Myth of Malham. Confirmed crew for Cervantes Trophy race are: ybw_mjm, sadlersailing, CG, JuJu, BER_Baggus, akvavit. Confirmed crew for the Myths of Malham are: ybw_mjm, sadlersailing, CG, JuJu, Gilles, Chaos, Amigo_do_Boteco1. Finally for this campaign the main event.